The market for reverse flame steam boilers in Europe has followed a steady growth path in the past few years and these boilers continue to witness healthy demand across a number of industries in the region. The several better operational benefits offered by revenue flame steal boilers as compared to other varieties of fire-tube boilers such, especially when it comes to heat transfer area and fuel consumption. The reduced carbon emissions due to the use of reverse flame steam boilers are the key factors attracting investment in the field of reverse flame steam boilers in Europe. Transparency Market Research estimates that in terms of revenue, the reverse flame steam boiler market in Europe was valued at US$92.70 Mn in 2016. The market is projected to reach US$142.18 mn by 2025, registering a CAGR of 4.85% from 2017 to 2025. In terms of capacity, the reverse flame steam boilers market has been segmented in the report into: up to 100 KW, 101 KW – 1,000 KW, and 1,001 KW and above. In 2016, the segment of 1,001 KW and above capacity held the dominant 44.43% share in the Europe reverse flame steam boilers market. The vast usage of the boilers with 1,001 KW and above capacity in refineries and the power industry owing to their high output and better specification is the primary reason behind their dominance. The high costs of these higher capacity boilers as compared to low and medium capacity reverse flame steam boilers is also a key factor attributable to their massive share in the overall market. In terms of end-use, the Europe reverse flame steam boilers market has been classified into: food, chemical, refineries, primary metals, power plants, and others. The chemical end-use segment dominated the market in 2016 with a market share of 28.39%. The segment of power plants followed and is expected to remain second to the chemicals segment in terms of demand for reverse flame steam boilers in Europe over the forecast period as well. In terms of country, the European reverse flame steam boilers market has been classified into the U.K., Germany, France, Spain, Italy, and Rest of Europe. In 2016, countries in Rest of Europe accounted for the dominant 27.60% share in the overall market, which is closely followed by Italy. Rest of Europe comprises countries such as Russia, Belgium, Ireland, Poland, Finland, and the Netherlands. The trend is expected to continue during the forecast period as well. In Italy, biomass-fired reverse flame steam boilers are in high demand. 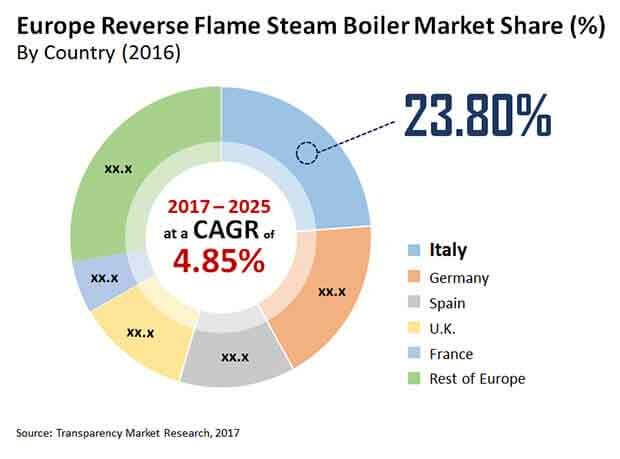 Demand for reverse flame steam boilers in Italy is driven by the shift from traditional steam boilers to more refined, energy-saving, biomass-fired reverse flame steam boilers. ATTSU is a leading manufacturer of steam boilers in Spain. Under its steam boiler product segment, the company also manufactures reverse flame steam boilers. However, demand for reverse flame steam boilers in Spain is expected to surge at a moderate pace during the forecast period, owing to availability of substitutes such as arch-tube boilers, water-tube boilers, and package boilers. In France, the EU Directive 2001/81/EC has approved limitations on the emission of certain air pollutants from national emission ceilings and large combustion plants. Several countries in Europe, including France, have banned aging boilers in order to maximize the energy saving. This is expected to drive the demand for reverse flame steam boilers in France during the forecast period. Some of the leading vendors operating in the Europe reverse flame steam boiler market are Atlantic Boilers, ATTSU, BoilerTech Pty Ltd, Bosch Industriekessel GmbH, Byworth Boilers, and ICI Caldaie S.p.A. This research study analyzes the market for European reverse flame steam boilers in terms of revenue (US$ Mn). The European reverse flame steam boilers market has been segmented on the basis of capacity, end-use, and country. The report features a detailed segmentation with market growth forecasts from 2017 to 2025. 2016 has been considered the base year and 2016 the estimated year, while all forecasts have been given for the period from 2016 to 2024. Market data for all the segments has been provided at the submarkets and country-specific levels from 2016 to 2024. The report provides a broad competitive analysis of companies engaged in the production and distribution of reverse flame steam boilers, globally. The report also includes key market dynamics such as drivers, restraints, and opportunities affecting the market. These are analyzed in detail and illustrated in the report with supporting graphs and tables. The report also provides a comprehensive analysis of the market with the help of the Porter’s Five Forces Analysis model, which helps in understanding the factors that affect the structure and profitability of the market. These are the bargaining power of buyers, bargaining power of suppliers, threat of new entrants, threat of substitutes, and degree of competition. The report includes Porter’s Five Forces Model to determine the degree of competition in the Europe reverse flame steam boilers market. The report comprises a qualitative write-up on market attractiveness analysis, wherein capacity, end-use and countries have been analyzed based on attractiveness for each region. Growth rate, market size, component availability, profit margin, impact strength, technology, competition, and other factors (such as environmental and legal) have been evaluated in order to derive the general attractiveness of the market. The report provides detailed insights into the reverse flame steam boilers business in Europe. Currently, numerous factors drive the market. The most prominent drivers include growing energy demand, government support, better efficiency, growing food & beverage industry etc. In-depth interviews and discussions with wide range of key opinion leaders and industry participants were conducted to compile this research report. Primary research represents the bulk of research efforts, supplemented by extensive secondary research. Key players’ product literature, annual reports, press releases, and relevant documents were reviewed for competitive analysis and market understanding. This helped in validating and strengthening secondary research findings. Primary research further helped in developing the analysis team’s expertise and market understanding. The study provides a comprehensive view of the Europe reverse flame steam boilers market by dividing it into capacity, end-use, and country. In terms of capacity, the reverse flame steam boilers market has been segmented into: up to 100 KW, 101 KW – 1,000 KW, and 1,001 KW & above. In terms of end-use, the reverse flame steam boilers market has been classified into: food, chemical, refineries, primary metals, power plants, and others. These segments have been analyzed based on historic, present, and future trends, and the market has been estimated in terms of revenue (US$ Mn) between 2017 and 2025. Country segmentation includes the current and forecast demand for reverse flame steam boilers in Europe. Additionally, the report comprises country-level analysis in terms of revenue for capacity and end-use segments. Key European countries such as the U.K., Germany, France, Spain, Italy, and Rest of Europe have been included in the study. Market segmentation includes demand for individual capacity type and end-use in all the countries/sub-regions.